Join us to explore the culture of Cuba through the lens of tennis. Using the exciting locations of Havana city and Viñales valley, you and your fellow travelers will engage with locals and have an authentic experience learning about the storied past, dynamic present, and hopeful future of this tropical paradise. Note: Travel to Cuba is limited for US citizens and we will be traveling as part of the People-to-People program. As such, we are required to have a full-time schedule of educational and cultural exchange activities that enhance contact with the Cuban people, support civil society in Cuba, and result in meaningful interaction between the travelers and individuals in Cuba. Orientation talk with your local guide: overview of the agenda, discussion about local transportation, nearby markets, internet access and other logistics, safety, cultural norms and current events in Cuba. Reception at Altamira art loft. A few years ago, Edel Bordón and his family embarked on a journey to establish an art collective in their apartment building. Spearheaded by his wife Yamilé Pardo, the family created the AltaMira art space, which features an exhibition and workspace off of the main lobby and collaborations with neighbors. Welcome dinner at Río Mar, located in the luxurious Miramar neighborhood, it has a whole terrace overlooking where the Almendares river flows into the sea. Nightlife suggestion: Attend a live performance by the Buena Vista Social Club at the Hotel Nacional. Cuban Tennis Clinic with Peter Pristach and local pros/players at Club Havana, Cuban National Tennis Center, Memories Miramar, or similar venue. Lunch at Doña Eutimia paladar. Famous for its ropa vieja and frozen mojitos, this cozy paladar made Newsweek Magazine’s top 100 restaurants in the world in 2012. The restaurant’s location in the beautiful cathedral square is unbeatable. Discussion with local expert, whose presentation will touch on housing, infrastructure, investment, and restoration programs in the city. It’s bound to leave you with a better understanding of why Havana looks the way it does today and possibilities moving forward. Walking tour of Old Havana’s Historic Center, a UNESCO World Heritage Site since 1982. Wander through the Plaza de Armas, a scenic tree-lined plaza formerly at the center of influence in Cuba. It is surrounded by many of the most historic structures in Havana as well as important monuments. See the Plaza de San Francisco, a cobbled plaza surrounded by buildings dating from the 18th century, dominated by the baroque Iglesia and Convento de San Francisco dating from 1719. Visit the Plaza Vieja, surrounded by sumptuous houses of the Havana aristocracy from the 18th and 19th centuries. Visit Plaza de la Catedral de San Cristóbal de La Habana. Salsa dancing lessons will provide insight into one of the most popular forms on Latin dance. In the evening, enjoy a festive dinner followed by live music—your chance to put your new dance steps into action! Lunch at Paladar Atelier. This restaurant is equally known for its atmosphere and exquisite cuisine. The lighting and textures of the house, which was home to a pre-revolutionary senator, coupled with walls adorned in modern art, create a cozy but modern setting. In the afternoon, head to the outskirts of Havana to visit Hemingway’s summer home and boat museum, La Finca Vigía. Today it still houses his expansive collection of books. It was here where he wrote two of his most celebrated novels: For Whom the Bell Tolls and The Old Man and the Sea. The beautiful grounds and bizarre tales from Hemingway’s many years in Cuba are captivating. *Depending on the interests of trip participants, there are a variety of optional activities to choose from. See a sample listing below. Rum and cigar tasting at Café Madrigal. A local expert will explain the qualities and traits of fine Cuban rum and cigars, pairing them together for the perfect match. Café Madrigal, owned and run by film director Rafael Rosales, is housed on the second floor of a beautiful Vedado home, where the walls are lined with captivating art work. Dinner Reservation at La Guarida paladar, famous not only for its delectable dining, but also as the location for the film Strawberry and Chocolate. It is housed on the third floor of a large, old town house carrying the charming ambience of the early 1900s. Concordia e Gervasio y Lealtad, no. 418 altos, Centro Habana. Depart for an overnight trip to Viñales, considered by many to have the most beautiful places in Cuba, the Viñales Valley National Monument contains stunning landscapes. The area is also famous for being the premier tobacco growing area in the world. Arrive to Viñales. Stop at the lookout at Los Jazmines hotel, before descending into the valley. Enjoy lunch on the grounds of a local farm, Finca Paraiso Argoecologica (the agro-ecological Paradise Farm), where we will learn about Cuban agriculture and tobacco production while indulging in an organic meal. Check-in at bed and breakfasts, known as “casas particulares,” or “private homes.” Since the 1990s Cuban families have been permitted to rent rooms out of their family homes to foreigners. Featuring comfortable accommodations and ample privacy, it’s a great way to interact with everyday Cubans. The afternoon is yours to enjoy on your own. Explore on your own and take part in activities that support the Cuban people, such as visiting art galleries, eating at private restaurants, speaking with artisans, or hiring private cars and bicycle or horseback riding in Viñales National Park to take in the unique and gorgeous scenery of the surrounding mogotes from horseback. Home-cooked dinner available at your casa particular in the evening. Walk with a local guide through a nearby valley and tobacco field to learn about local agriculture and its role in the Cuban economy. Visit the home of a local tobacco farmer, who will teach us about tobacco’s cultivation and production process in Cuba, followed by a rolling demo. He might even light up a cigar or two for the group. Explore downtown Viñales. Walk along the main street and visit the central plaza and local markets and enjoy a local lunch. Dinner at Mediterraneo Havana. This modern, family-run paladar in the Vedado neighborhood produces much of what it serves at a nearby farm in Guanabacoa, Cuba. Cuban Tennis Clinic with Peter Pristach and local pros/players. Lunch at La Makina Gastro Bar, located near the Museum of the Revolution and the Museum of Fine Arts in the heart of Old Havana, it is known for the exquisite cuisine dishes and a charming ambiance. Visit to the Nostalgic Cars restoration garage and discussion with the owners Nidialys Acosta and Julio Alvarez. This husband and wife couple has become the face of entrepreneurship in Cuba, taking advantage of the new economic changes to restore and operate these American beauties. Enjoy a ride in American classic cars from the 1950s. Recognized all around the world, if you have not seen them in person, you will have seen them on TV or in movies. 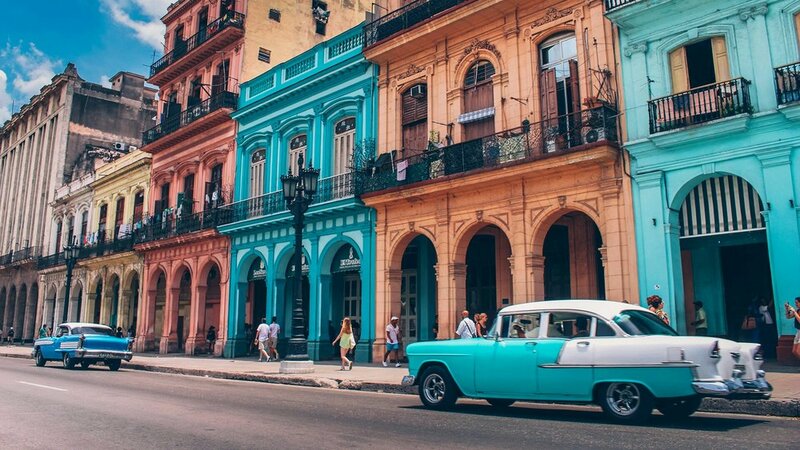 Havana cars are iconic and classic; they are so recognizable that they become cultural symbols of Cuban cities. Behind the scenes art tour. Visit different homes and neighborhoods to tour the studios and galleries of established and up-and-coming Cuban artists. Dinner at Tierra, Havana’s newest international dining spot, located inside a container in the Fábrica de Arte Cubano. This venue features live music, art, and dancing. Our final day in Havana will begin with an optional morning visit to a local weekend market or a last opportunity for tennis. We’ll then return to the hotel and prepare for departure. Airport drop off is included in your program and will be arranged on an individual basis based on your specific return flight. *Optional activities based on the interests of the trip participants. We can offer different or additional custom experiences. For example, enjoy a Cuban baseball game, tour of El Morro Castle with a local historian, volunteer with Barrio Habana Project, a non-profit organization that leads a community sports-arts program in Old Havana. If you prefer the beach, we can head to Eastern Havana for a tour of Alamar, a Soviet style housing project, and Havana’s eastern beaches. Alamar, one of Havana’s largest neighborhoods, is filled with prefabricated buildings completed by the popular micro brigade movement in Cuba in which neighbors constructed and worked on building their own homes. Meet with local residents and visit a farmers’ market and ration store to get a feel for local living. Visit Playas del Este (eastern beaches), where Habaneros go to escape the city heat. Take a stroll in the white sand and a dip in the turquoise water. Or, we can simply stay in town and visit local art studios or simply enjoy a walk amid Havana’s beautiful architecture and parks or El Malecón, a broad esplanade, roadway, and seawall that stretches for five miles along Havana’s coast. The opportunities are many and we will refine the itinerary based on the needs and interests of the trip participants. **Details above are subject to change as needed. Start and End Time: Arrive to the Havana airport by 5:00 PM on Day 1 and depart as needed on Day 7. Visas: US-based airlines distribute Cuban visas to passengers at the US airport upon flight check-in using the OFAC People-to-People documents we will provide for you. A Cuban visa costs 50-100 USD, depending on the airline. Enrollment: To enroll in the Cuba trip, click the Enroll Now button at the top and bottom of this page. 500 USD deposit due by May 1, 2019 and final balance due October 1, 2019. Space is limited! We recommend enrolling early in order to secure your spot. Enrollment is first come first serve.